Have you ever just had one of those weeks? Well, what started out about a week ago as what I thought was the end of the world is looking pretty bright now. Anyway, all my personal drama of the past week made me think of a time about 3 years ago when I had my wisdom teeth removed. I had it done in my dentist's office with local anesthetic and a good dose of "I don't care about anything" drugs. Afterward, I thought I was going to die from the swelling and pain. So, I basically crashed and had to be woken up every so often to change the ice (uh...bags of frozen veggies) that I used to keep me iced down to prevent swelling. [By the way, if you ever need ice for an injury, and haven't tried it, bags of frozen vegetables, particularly corn and peas, are fantastic for that purpose.] Anyway, at one point my sweet caretaker put a bag of blueberries on me as we’d run out of other veggies. While I slept, the juice leaked out all over the towel we had wrapped around my head. When the next wake up time came and she saw it, she thought I’d been bleeding profusely and we both about had a panic attack! It didn't take long to figure out it was just blueberry juice, but the point is that it sure looked like I was in bad shape initially. In the end, it turned out fine. In that case, we switched back to frozen corn and I eventually stopped swelling and hurting and got over the ordeal pretty quickly. Sorry for the lengthy absence from posting, but I'll get back to posting more regularly in the days to come. I stumbled across this poem by Rudyard Kipling today and it struck a chord with me so I thought I'd share it. It speaks of character and persistence and so much more. I love this quote. Every time I give a presentation I hope it's obvious that I feel strongly about my subject. But the most important thing is that the audience takes away something that moves them. 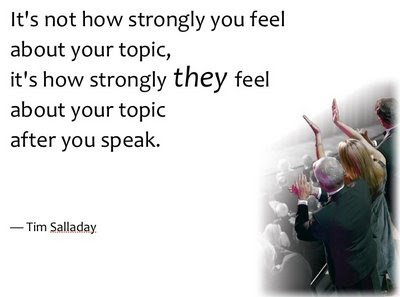 While recently attending a course taught by Garr Reynolds (PresentationZen) and Nancy Duarte (Duarte Design, Slide:ology), Nancy said something that is a great corollary to the Salladay quote. She said, "You can give a great presentation or you can give a presentation that moves the world." Amen sister!